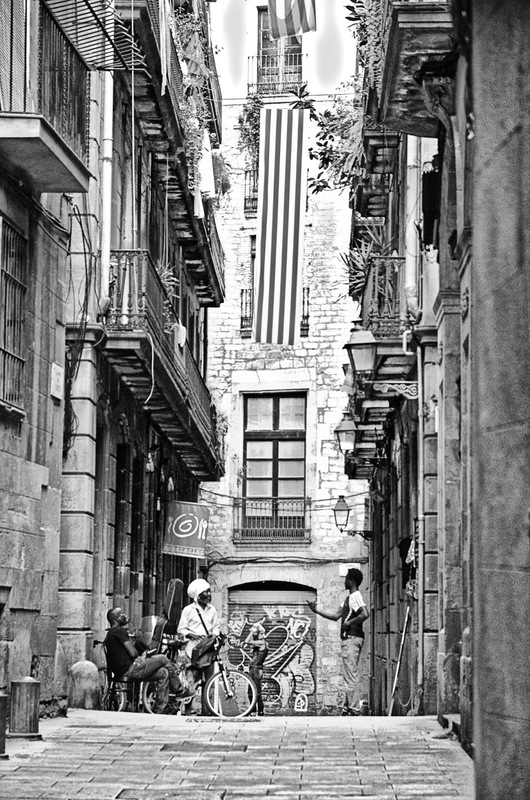 Under the Catalan flag new citizens living in the old quarters unknowingly compose spontaneous scenes that were unthinkable 20 years ago. These new Catalans come from all over the world and they seem to have been always in Barcelona. Maybe it is because their essence never left, because the Moors were here, the Jews were here, the Romans, maybe with their Nubian slaves were here, the Phoenicians, the Visigoths, you name it, even pirates came here often. So the melting pot was always here. It's just that Barcelona had taken a small break. Perhaps Franco, helped a little bit. The point is that this process will not stop because big cities have always been a lure for immigrants, for nomads like the castle walls attracted people in Medieval times and burgs appeared. The time has come to call everyone a Catalan every single person living in this burg, no matter the language, the creed and the origin.